Failing to find suitors for their fickle daughter, the king and queen hold a great contest, with the victor gaining the right to marry the princess. To the chagrin of the king, a simple farmer mysteriously gains entry into the contest and sets about winning all of the events through unconventional means. The contest takes a dark turn, however, when the king tasks the suitors with the slaying of an ancient dragon newly awakened in Black Mountain. Is the cleverness and imagination of the farmer great enough to overcome a god-like being? 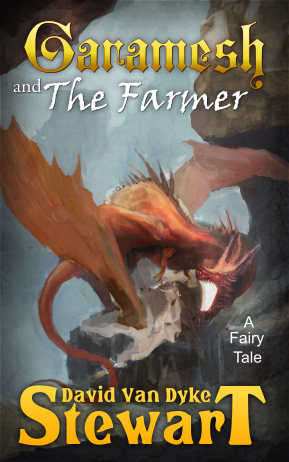 Garamesh and the Farmer is a novella/novellette size story that takes the form of a traditional fable or fairy-tale. It uses sets of three to illustrate a series of moral points, from the importance of using one’s mind to overcome challenges to the advantages of helping others. The story is actually extracted from a larger fantasy narrative that has yet to be published. In that larger narrative, it is a story told to a child, but I have re-created it in a single continuous story because I think it has it’s own merits and is appropriate and useful for children while being interesting for adults. An Audiobook version is available now on the audible platform. Don’t use Kindle? No problem. Find it for free on these other platforms. If you enjoyed this book, you’ll probably be interested in my fantasy world (from which Garamesh is derived) found in The Eternal Dream. You may also be interested in my Samurai novel Muramasa: Blood Drinker, available on Amazon in Paperback and Ebook.